We all know our dogs are going to help out... so lets doggedly chase down a quick guide to everything your canine pal will help you out with! 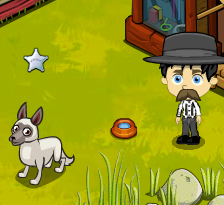 When your dog is either following you or sat at his/her bowl click them and select the "Activate" option and you'll see your deputy star appearing above the dog's head. What you can do now depends on what you've trained them to be able to do! Each activity costs Chunky Chow. Activate your dog, aim him at debris and watch him dig them up effortlessly. This also works as a CARE PACKAGE and will drop needed items for missions. Once your dog is activated he can save you some energy by clobbering varmints for you. Simply click on the pesky critter and it'll be gone in just one attack, even a bear can be removed in a single hit. Using your trained dog on an animal can be done in one of two ways. Using them on a ready animal will tend the animal as usual. 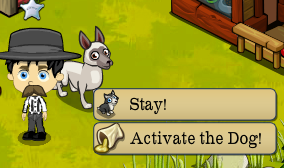 However, using the dog on an UNREADY animal will work in much the same way as the animal ready boost. It'll make that animal instantly ready to tend, a very hand thing to have for timed missions and probably what most folks will use their dog for. Chunky Chow - Where to find it. From the Kennel - Every day the Kennel Daily Bonus will give you a Chow. From the Pet Store - Chow can drop from the Daily Bonus. Post rewards - Keep an eye on neighbour's walls, many missions will be giving Chunky Chow out as a reward for clicking the brag post. At the moment that's all the methods we know but there might be more options such as gifting them coming in advance, we're not sure! As soon as we know more, we'll post it here. Until then why not answer out Facebook Question on which dog activity will be the most likely you'll use! As we know, all dogs are bred for different things so let's take a look at all the breeds available in Frontierville!